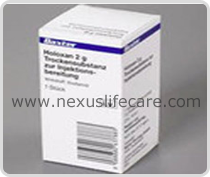 Uses:- Holoxan Injection is an antineoplastic agent, prescribed for certain types of cancer (breast cancer, lymph cancer, lung cancer) in combination with other medicines. It stops the growth of certain cancers. Side Effects:- Hemorrhagic cystitis. Alopecia. Nausea and vomiting.